Ash class teacher is Mrs Holdsworth and Maple class teachers are Mrs Williams Monday, Tuesday & Wednesdays and Mrs Skelton Thursday and Friday. PE days are Monday and Friday Children must wear a PE kit for both lessons which consists of royal blue shorts, white t-shirt, pumps or trainers. In the better weather we will be having PE lessons outside so children also need an outdoor kit. Homework is sent home on a Friday and needs to be returned to class the following Wednesday. Every week they will have spellings and reading to complete. They will also have maths homework which will be during the spring term this will mainly be times table/ division facts to learn by heart. Guided reading will take place once a week. Please can you make sure that they have their books and reading records in their book bags for when they read. In the new homework policy it is recommended that your child reads daily for 10 minutes. Whenever someone listens to them read can we encourage you to write a comment in their reading records at least once during the week. As your child becomes a more confident reader and can read to themselves they can also write a comment in their records. This is also a good form of communication if you need to pass any message onto us. Our focus for the Spring and Summer term is on comprehension. As well as discussing word choices the author has used and what particular words mean. Spelling We tested the children on the lists below and once they got a spelling incorrect they stopped the test. This then indicated which list needed to go home. The list is stuck in their green spelling books. Each week, they will be given a spelling test on all the words from the list. The day they have their test may change from one week to the other. They only get a new set of words sent home once they have got all the words correct. Below is the whole set of spelling lists. This half terms topic is... Animal Watch! Please look at our Spring 2 overview plan in the CURRICULUM folder. On Tuesday 16th April at 9.10am we will be holding a SAT’s talk to inform you of what is involved in the teacher assessment tests and tasks that take place in May. The meeting will be held in the main hall so you need to come through reception. Before the meeting we will have maths activities in the hall for your child to take part in. This will be an opportunity for you to see the areas covered within the year 2 maths curriculum. Your child has been send home with a log in for Education City so they can play on educational games linked to Science, English and Maths. Any problems with logging on please come and see me. I hope you have all manage to make an appointment for our second parents evening of the year. If you haven't for any reason then please come and see your child's class teacher and we can make an arrangement to speak to you at a more convenient time. Additional to you child's target sheets you were given at parents evening, below are additional sheets with information about the Year 2 curriculum expectations and additional prompt sheets if you want to support your child more at home. Also take a look on our SATs tab to give you more information about what these entails. We will be holding a meeting later in Spring to explain more about the process of these assessments. CHICK, CHICK, CHICK, CHICK, CHICKEN! We are all super excited about the delivery we had today. Both classes received 10 chick eggs in an incubator from the company called Living Eggs. We then get to keep them for two weeks to enable us to watch them grow and change, which is part of our Science curriculum on life cycles and stages of growth. Hopefully most of the eggs will have hatched by the end of the week. Keep visiting our page to watch their development. All of the chicks hatched during the first week. In the second week we got to get them out every day and hold and stroke them. We needs them and drew coloured dots on their heads so we knew which were which. We were all very sad to see them go but they were getting too big for the brooding box and needed to go and be able to run around at a farm where they will have more space. In Year 2 we had a full History day based on Heritage. We discuss what is special to us and memories we have that shape our lives. After that we drew our own family tree and discussed how our families are all different. We then looked at significant buildings in Morley and those in other areas of the world. We then used a local map and found landmarks of our local area. Another exciting activity we did was tasting different Yorkshire food and learnt some Yorkshire dialect. In Ash class Mr Agar came in to talk to us about his heritage and family background. 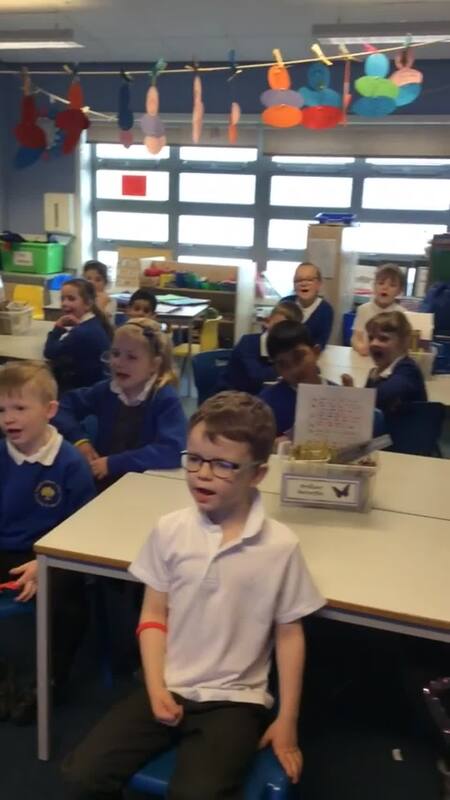 In geography we have been learning a song to help us remember the seven continents. We had a fantastic trip to Lotherton Hall. We learnt lots about different animals in rainforests and Antarctica in the workshop. We even got to see a tapia and monkey skull and feel real snake skin. One of the best parts was seeing the penguins swimming and being fed. We would like to thank the PSA for contributing to the cost of the trip to enable us to keep the cost down. Hopefully this will meanthat we can go on another class trip in the summer term. Take a look at some of the things we got up to in Autumn 2. Our topic was FIRE, FIRE! We first visited the Morley Fire Station. We then learnt about The Great Fire of London. We made bread like they did in the bakers shop in Pudding Lane. This also linked to our science topic of changing materials. We also designed and made our own moving fire engines using wheels and axles. In groups we made Tudor houses out of boxes and then burnt them on the field to replicate how the fire spread during 1666 in London. In science we focused on changing materials. We made a clay pot using different forces to change the shape or the clay. We learnt about when changes are reversible and irreversible. In our year group planters we planted different bulbs so that in summer we can observe how they have grown over time. Take a look at some of the things we got up to in Autumn 1. In Science we were learning about identifying materials and their properties. We used a newton meter to measure the strength of different materials. In Maths we focused on place value and used lots of different equipment to help use to do this. Also in Geography we were learning about our local area. We walked around our school grounds first then the area around school. We then drew a map of where we had been. We had a fantastic time visiting Morley Fire station. We got to look around the station and find out where the emergency calls go to and how they are processed. We also found out about all the different equipment that is stored inside the fire engine, and how some of them are used. We were then lucky enough to sit inside the fire engine and squirt the hose. We had lots of fun!